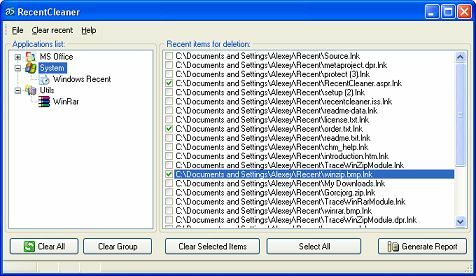 RecentCleaner is a personal privacy tool designed to clear recent files lists of various programs. Clearing recent file lists makes it impossible for an intruder to recover any trace of recently accessed files, making it really hard to quickly find private files. RecentCleaner is a plug-in based utility. The authors will continuously improve it by adding support for new programs. RecentCleaner already supports cleaning of recent file records in popular MS Office applications, such as Word, Excel, Power Point, FrontPage, etc. Also, RecentCleaner supports WinZip and WinRAR utilities. Just contact the authors for requests for new plug-ins. The RecentCleaner interface is divided into three parts: Applications, Items and Commands. The Applications list is represented as a tree, where the root elements are groups, such as Office, Utilities, System. Opening each element gives access to a list of recent records for every specified program. The Items section shows what information is accessible to a possible intruder. With RecentCleaner, it's easy to protect your privacy. One can run RecentCleaner and click the "Clear All" button. The program will scan all supported programs for recent files and clear all such records. It is also possible to delete only some of the records by checking certain items in the Items list. RecentCleaner has a reporting feature, which provides users with a detailed report about which records are available for cleaning and which recent files were cleaned. This feature can also help to locate a file that was accessed recently.